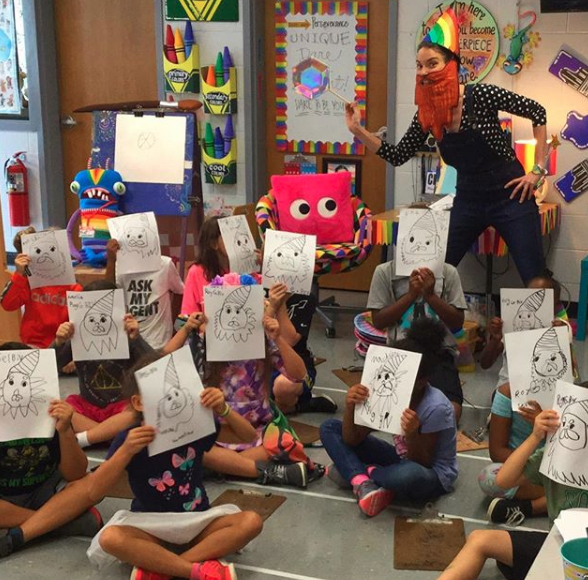 It leads kids to believe that there is only one way to draw. It puts too much pressure on the kids. 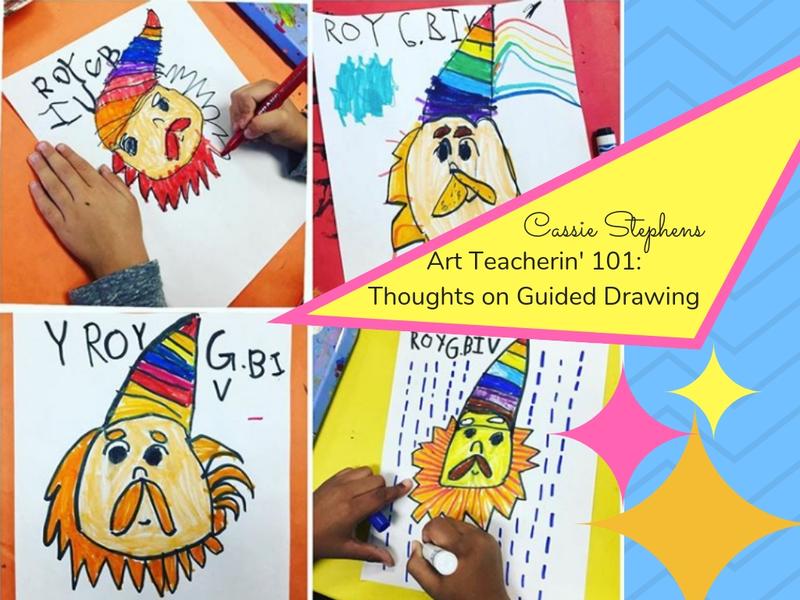 AND I AGREE...if guided drawing is a tool used incorrectly in the art room, it can be all of those things. So I thought I'd share some tips and tricks that I use in my art room that eliminates the pressure, the restrictiveness and the notion that there is only one way to create. 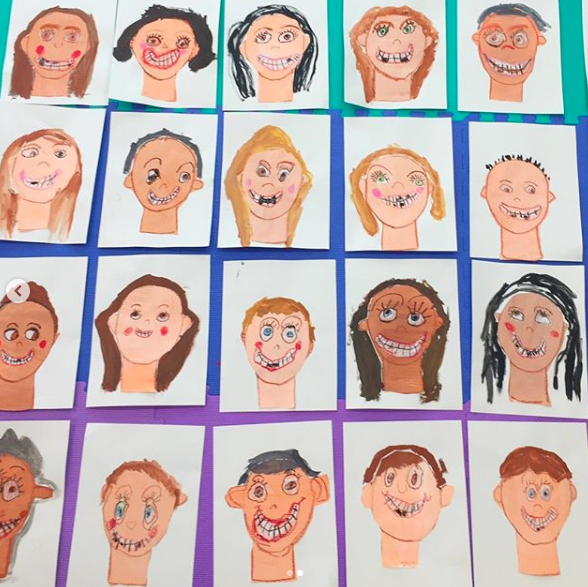 I tell the kids that we are all unique and our artwork should reflect that. 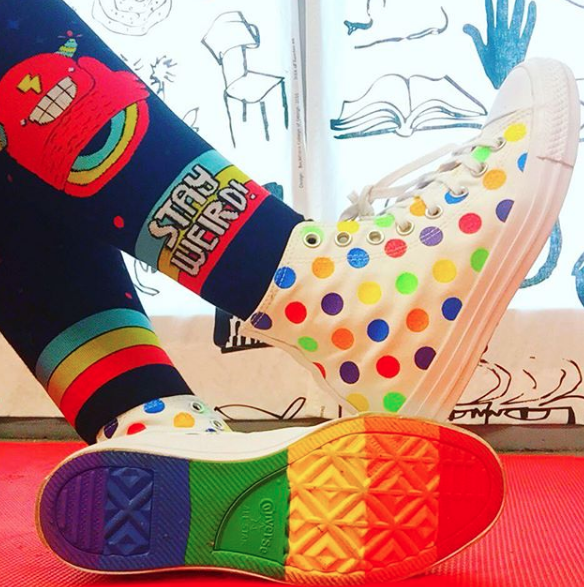 We have a little pep talk before drawing: each of us is unique and that's a wonderful thing. 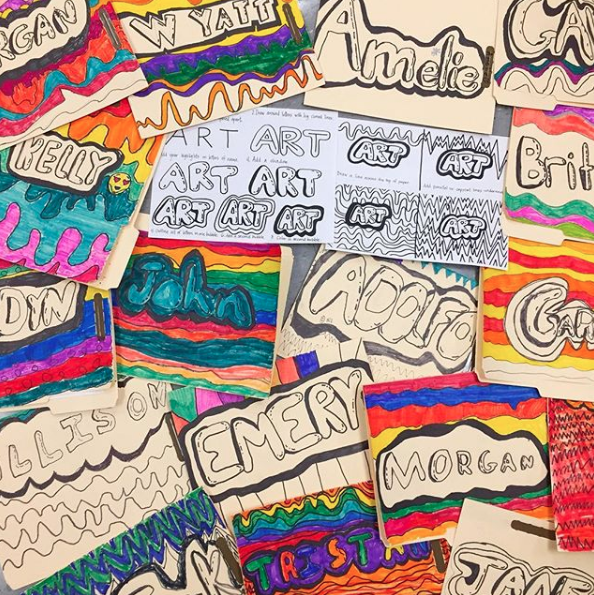 We are all going to hear the same directions...and each of our artist's brains are going to hear and translate those directions differently...and our artwork will reflect that. I tell the kids that if I had wanted copies of artwork, I would have just MADE copies. But I want to see their artistry, their work of unique art. I call our Guided Drawings, Practice Drawings. I tell the kids that this drawing that we are doing together is just practice, not perfect. If they aren't happy with their drawing, DON'T WORRY ABOUT IT, IT'S JUST PRACTICE...and you can do another one next art class. This eliminates the pressure of trying to be perfect (and how is?!). I also tell the kids that they are not to throw away that drawing. If they do decide to redo their drawing the following art class, they are to use their initial drawing as their guide...and keep it. Take it home, color it, give it to mama, give it to me. But the trashcan is NOT an option. I've also noticed that by the time the second art class rolls around, most kids have forgotten what little thing bothered them and are happy with their drawings. ALSO...having kids practice on dry erase boards as they draw along with you makes a big difference. Then they can take that drawing to their seat and copy from that onto a piece of paper. When we draw on the floor, we either use pencils with no erasers or Sharpies. 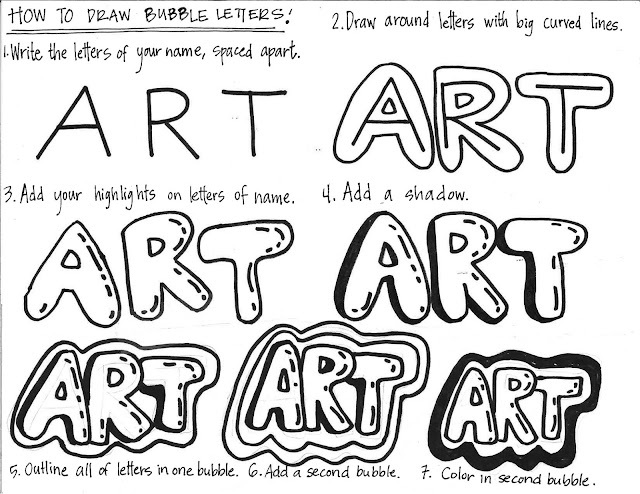 I don't want the kiddos to use their art time erasing holes in their paper. We talk about Beautiful Oops! What a great time to talk about all the endless options you can do if you draw something unexpected. It's a happy accident. Let's see where it takes you! And that really helps release the pressure the kids may feel. 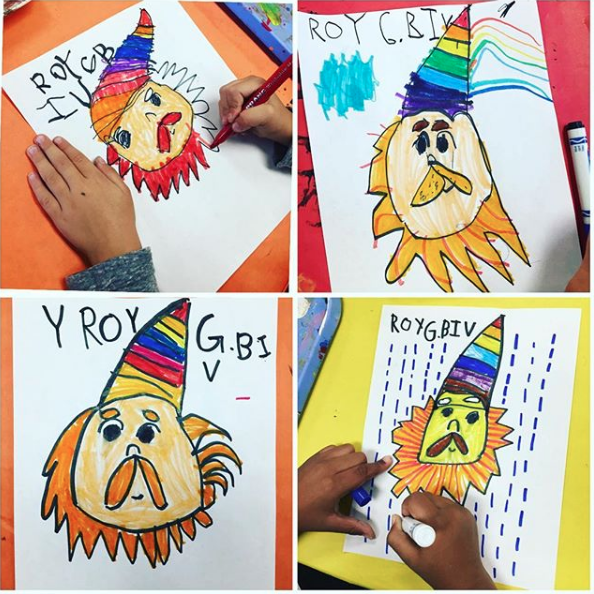 I recently recorded myself teaching my kindergarten how to draw Roy G. Biv. 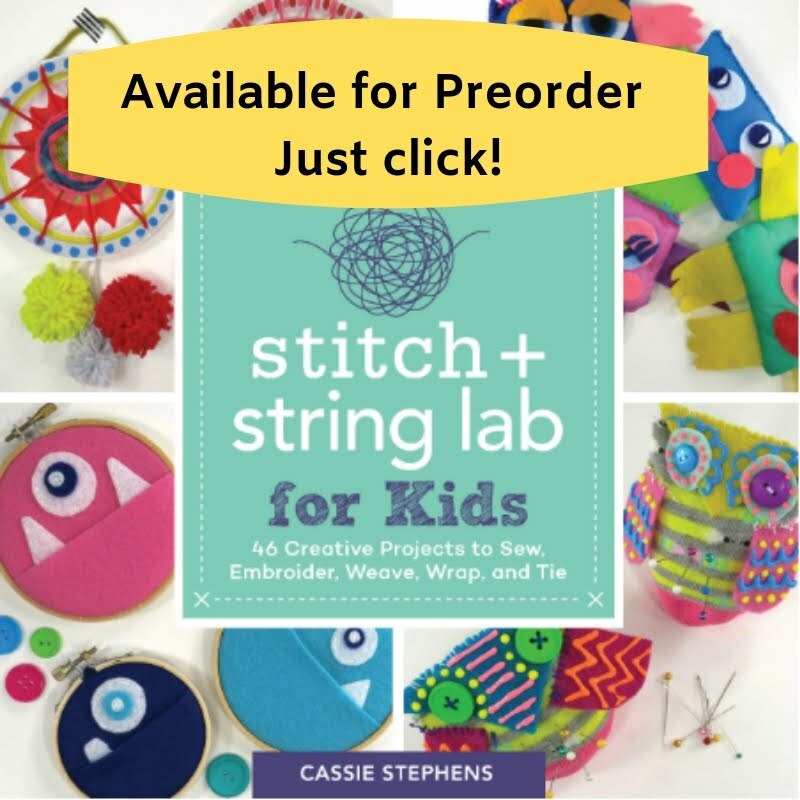 If you are interested, you can see how I try to keep it silly, fun and light for the kids. Well, better late than never ever, amirite? My students are just now getting rolling on their sketchbooks tho that's no fault of their own. I've been doing sketchbooks with my kids for years now ... and had a pretty fool proof way that worked for me and the kids. But there was always one thing kind of bothering me...that I never had a way for them to add informational pages to their sketchbooks. You know, like an Elements of Art reference sheet or, what I'm really excited about, some Art History Rocks sheets. 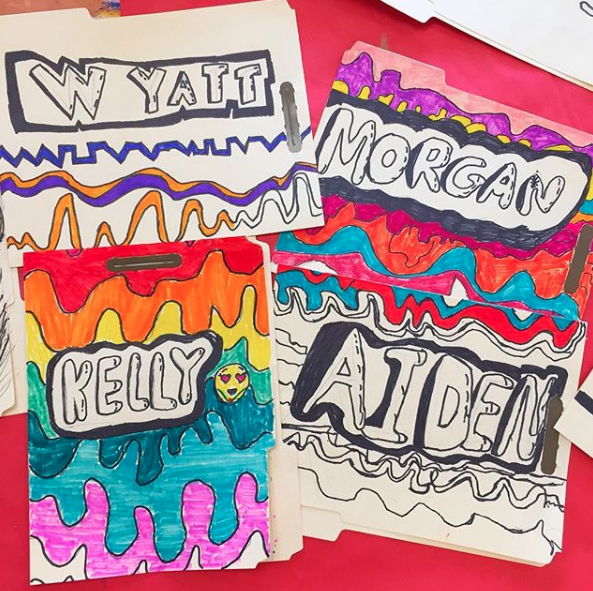 So this year, instead of using manilla folders with pages stapled inside, my kids are using pronged folders that we can add pages to! Because my students are working on their weaving and sewing projects right now, they are all finishing their work at different speeds. While allowing time for the kids to finish AND providing my early finishers with a quality drawing lesson, I created this sheet. It worked GREAT! My students drew lightly with pencil first on their folders then showed me their drawing before going over their lines in pencil. If you'd like this sheet, you can download it here. 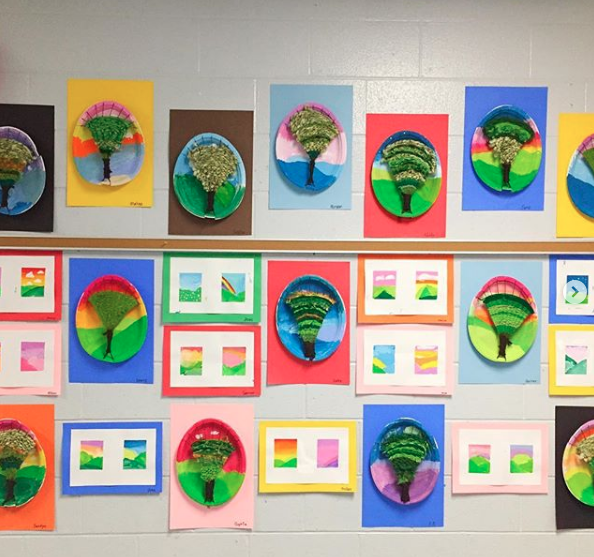 This is the work of a couple third graders after they finished their weavings. They were so stinkin' proud of their work! The ABC sheet is one I found online. You can find it here along with a great video. 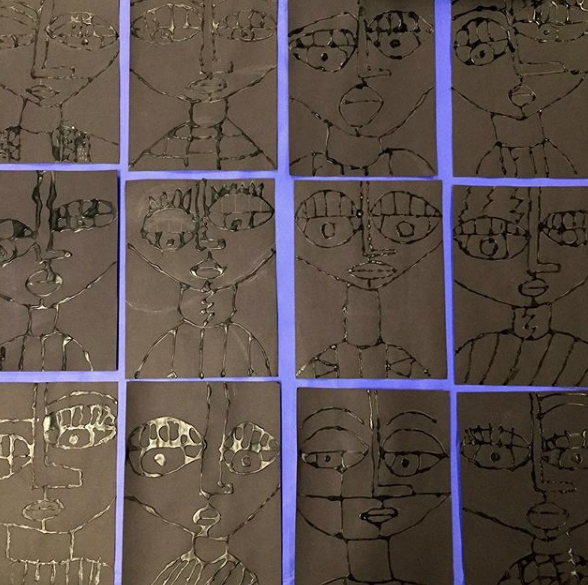 For the background, we looked at the work of Jen Stark and talked about creating a repeating line pattern. The kids chose a line and simply repeated it in any way they liked. Again, they were working independently so lots of options were open to them. color was added with markers. The kids are so proud of their covers so far. They'll continue adding to these as an early finisher project. I CANNOT WAIT to introduce them to our first Art Rocks theme and get them rockin' in these books. Stay tuned! I love seeing how other art teachers teach. I am loud, annoying and definitely not for everyone...but that's me. That's who I am and that's how I teach. 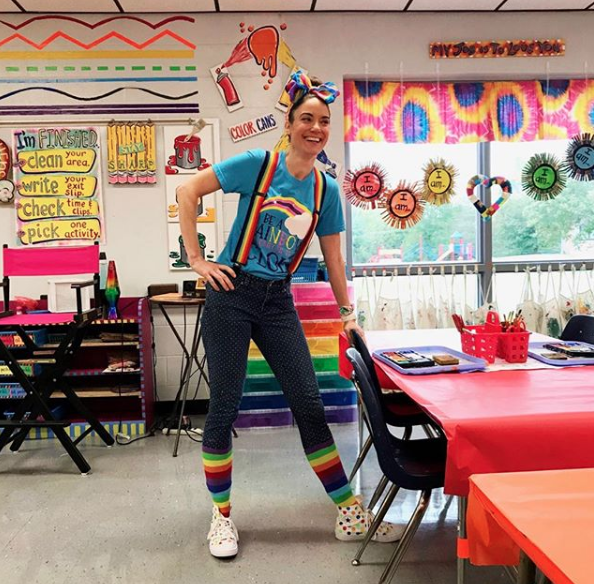 I really think finding your voice in your classroom is the best way to be your best teacher. So while I like to share what works for me, it's by no means me saying that you should do it too. It's just an offering of ideas and a little peak inside. 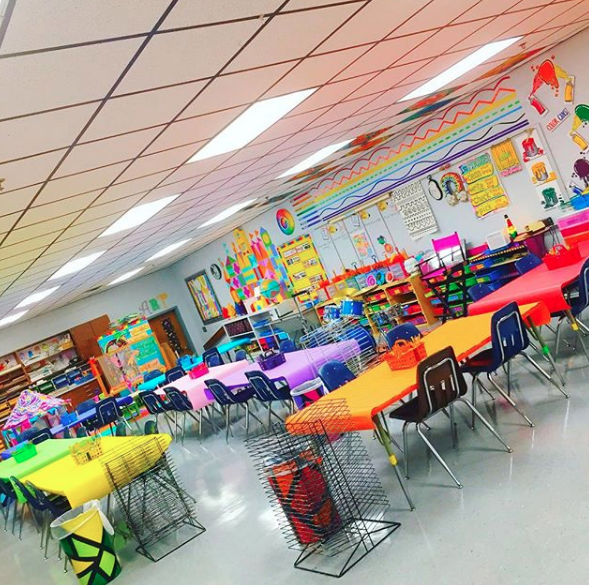 Y'all are always welcome to my art room! So pull up a chair, roll up your sleeves and...GO CLEAN SOMETHING for heaven's sake. This place is a PIT! 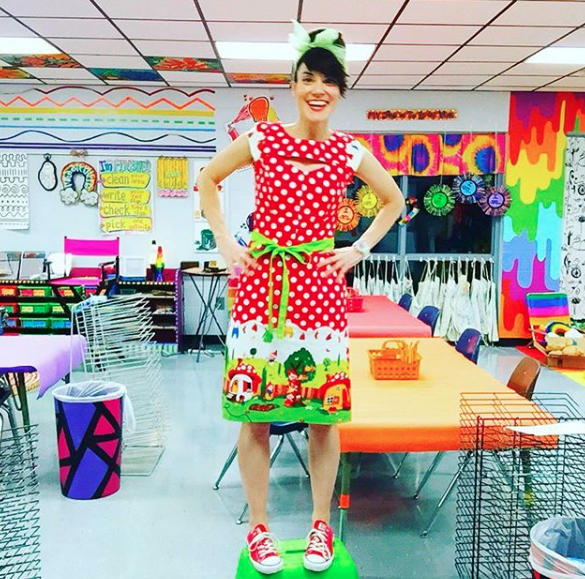 All kidding aside...stay tuned...I've got more videos coming your way this week and a follow up to our sculpture lesson. Love y'all! Today was my last day of school for the year...and it totally didn't feel like it. The weather is wet and cold and I still have packing up aplenty to do. Not to mention, I have new ideas for the next school year that I'm excited to start plotting and planning. 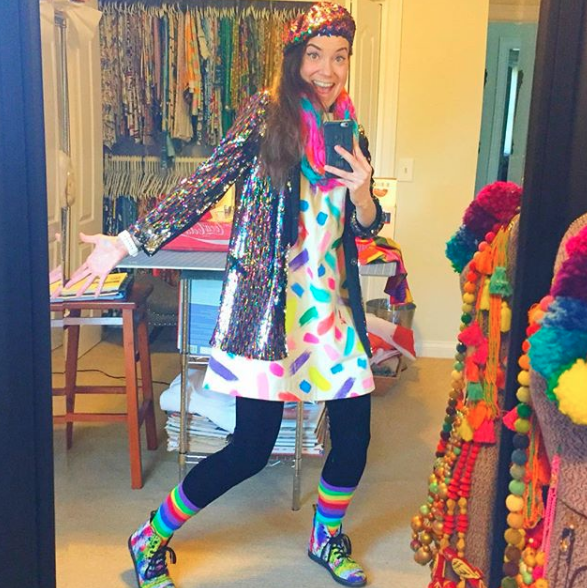 However, there is a high percentage that I will end up spending my days in my sewing room and totally neglecting that last thing. I mean, really, who am I even kidding? I know that many of y'all are still in the throes of art teacherin' land and for that reason, I thought this episode of Art Teacherin' 101 could feature my fave things to do with the kiddos at the end of the school year. 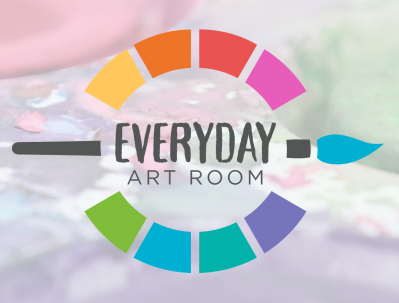 Weaving, origami, drawing, blocks, dry erase boards, draw-alongs with this channel are just a few of my favorite engaging end of the school year activities. In the past, I've had my older kids do surveys of their fave projects and fave aspects of my class. That was always fun to read and enlightening. 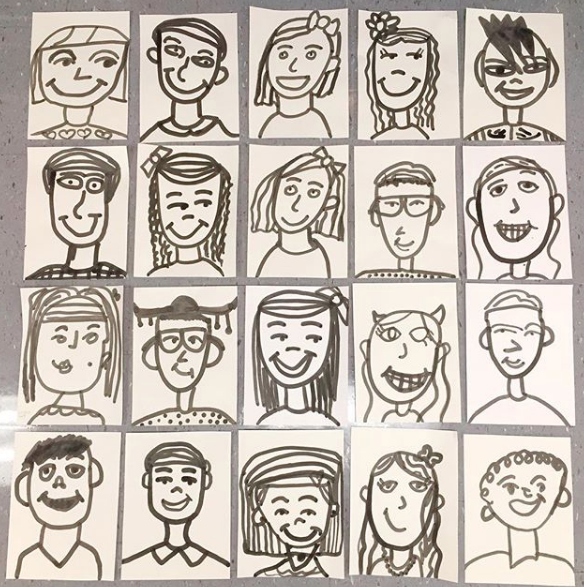 We also drew portraits of our classroom teacher and wrote about them which was given to them as a sweet gift from their class. 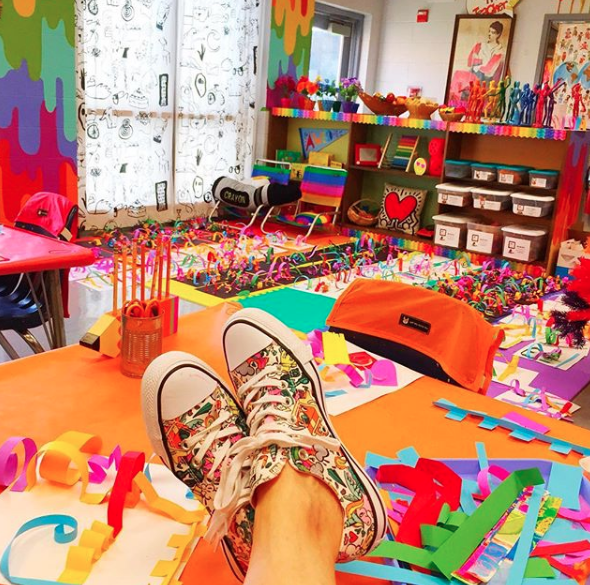 There are really so many ways to keep the kids active and engaged...I'd love to hear your ideas! Until then, you'll find me sleeping in, sewing up a storm and spending time with the hubs, our cat and my sweet friends. If you are anything like me (and bless, as we say in the South, if you are), then you prolly got that art ed degree of yours without being a total pro in all forms of media. 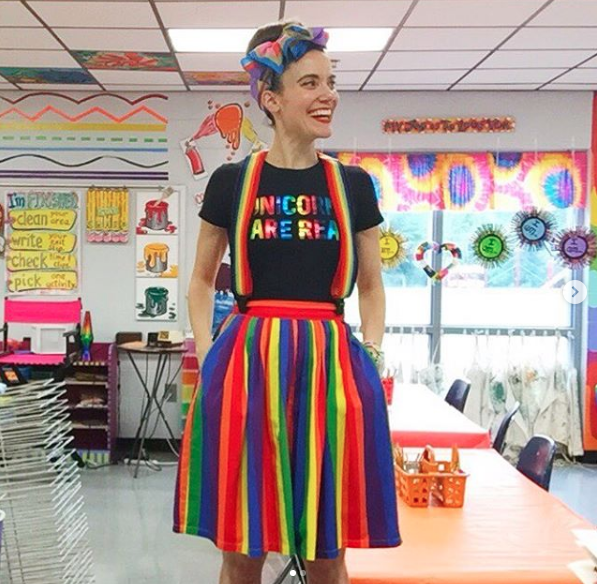 I didn't take a single printmaking or ceramics class in college and I got a C in textiles (which is a fave but at the time, I was huffing too many paint fumes, er, REALLY into my painting class, to be bothered with warping that freakin' floor loom). What I did get is a two year degree in oil painting because...you know, that's something we teach to the 10 and under set. Ahem. All that to say, we are expected to be at least somewhat knowledgable about the media we share with our students. But, let's be honest, a lot of times, we are learning right along with the kids. 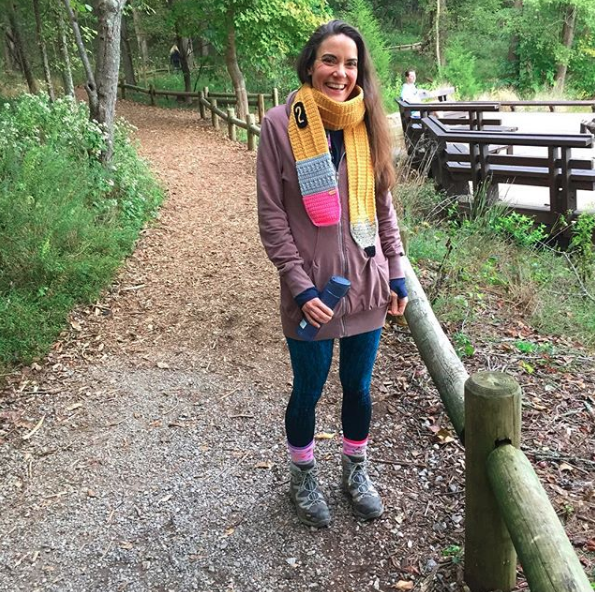 Let's talk about some of the things I've shared and just where you can find them. * Clay mats. I mentioned The Clay Lady and her clay mats. I seriously have had mine FOR YEARS. They are worth the cost of $2 each. * Toothbrushes and doggie bowls. Seriously, what would we art teachers do without places like The Dollar Tree?! Toothbrushes are perfect for teaching scoring and doggie bowls are awesome for holding slip while preventing spills. * Texture! A visit to your thrift store will provide you with a good stockpile of texture for your clay adventures. Placemats, cable knit sweaters, burlap, stamps, you name it. If it has a texture, your clay will capture it. * Skewer sticks. Perfect for cutting, drawing and carving into clay. Something I failed to mention: what to do with those projects that kids work on for more than one class? To store these effectively, I have a stockpile of old and large zip lock baggies. The kids write their names on the bags in Sharpie, wrap their project in a damp paper towel and place gently inside the back. I tell the kids not to zip their bags shut as that usually traps air inside. Instead, I tell them to push the air out and tuck the opening of the bag under their project. This will keep their clay workable for about a week. If you would like to continue this clay chat, you are in luck. All throughout the month of May, I'll be hosting clay chats (and craft nights, so come armed with clay!) right here, every Wednesday at 8pm CST. You can work with any ole clay you like...however, I'll be using the clays made available in this kit which you can purchase here. For more info on what we'll be up to, check here. And now, I thought I'd share with you some of my fave clay projects over the years (many with video links!) for you to take back to your own Art Teacherin' Town. 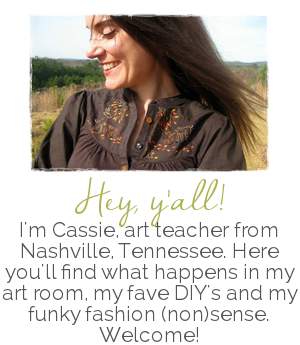 LOOOOOVE to hear your fave clay projects and words of wisdom. Please feel free to leave in el commentos below. 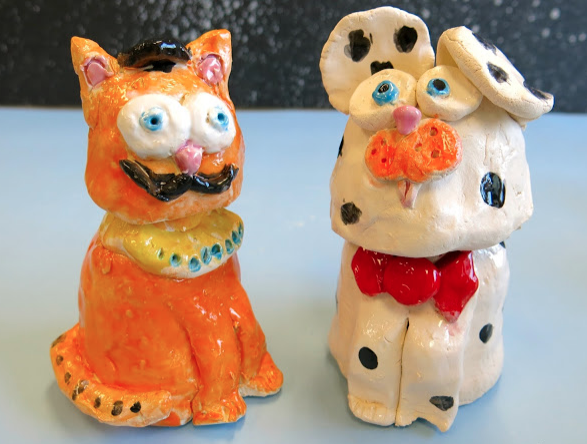 This clay project was one that I did with my second graders FOR YEARS. They love it, it's a great way to introduce texture, slab, coil and glaze. It's also a quickie and with my short art classes, it worked very well. This was a fun project my third graders did one year. If you've taught clay before, then you've probably done the coils-in-a-styrofoam-bowl project (I know I have!) 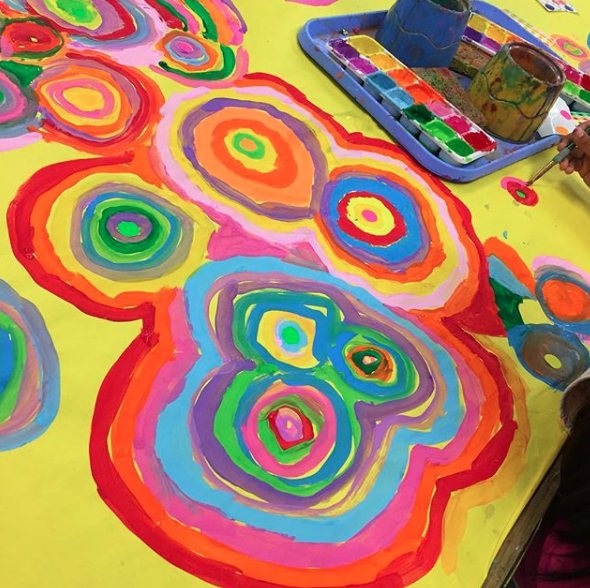 a different spin on that is having the kids use slabs of clay to create flowers. We had a spring theme one art show and these fit in beautifully. I almost always do a clay project that emphasizes texture with my kindergarteners. I'll share all of those projects...but this one is always a fave: texture butterflies! 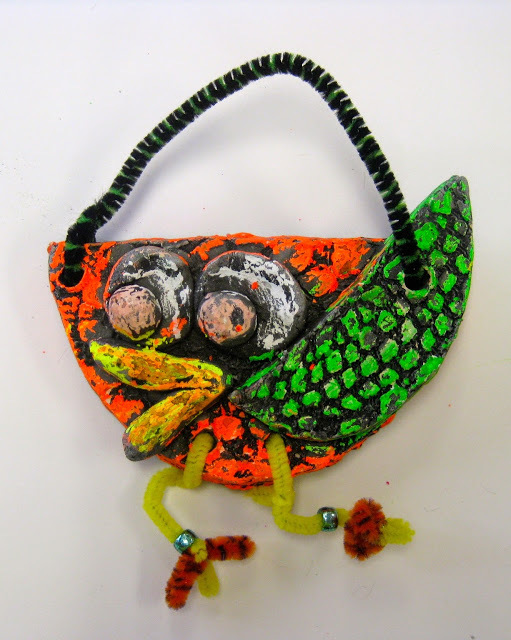 This is another kindergarten clay project with an emphasis on texture. 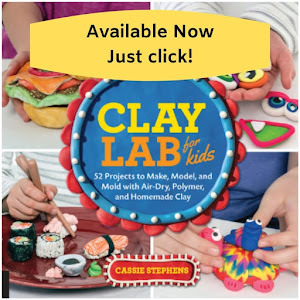 This project is also shared in my clay book...but with homemade clay! These clay fish by my first graders always crack me up! They had so much fun creating the silly expressions on these a couple years ago. If every glaze is not an option, here is a fun alternative: florescent oil pastels and watered down black paint! Inspired by the painted elephants in India, my fourth graders created these fun guys one year. 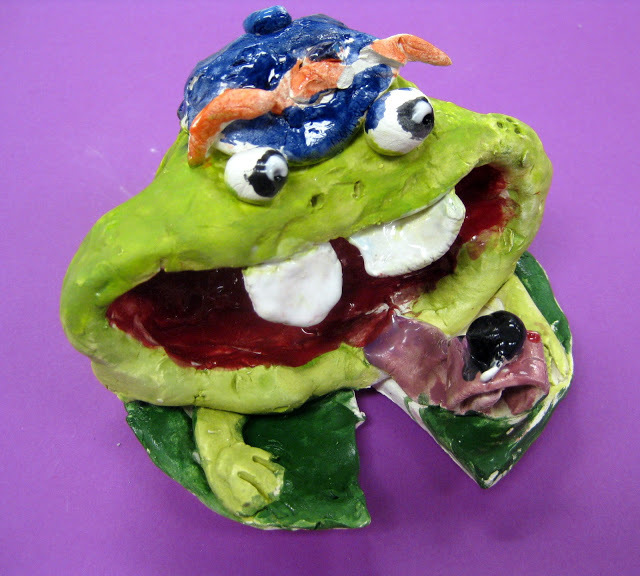 Funky frogs were created by my fourth graders one year. They had so much personality! This was a project we worked on over the course of a couple of art classes...which really allowed the kids to get creative. One year, to go along with our Asian theme, my fourth graders created these fun pandas. Each had their own wild and wacky personaltiy. To go along with that theme of Asia, my third grade kiddos created these Chinese dragons which they had a great time doing. So I might have a thing for animals and clay...what do you think? 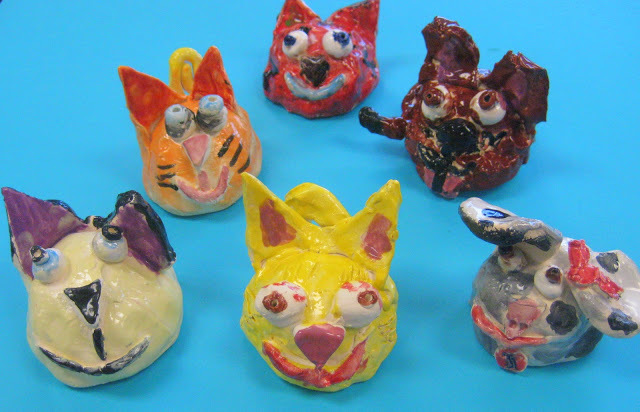 My kindergarten and first graders created these pinch pot pets a couple of years back when our art show theme was to raise money for a local animal shelter. And, what do you know, animals are our theme again this year! 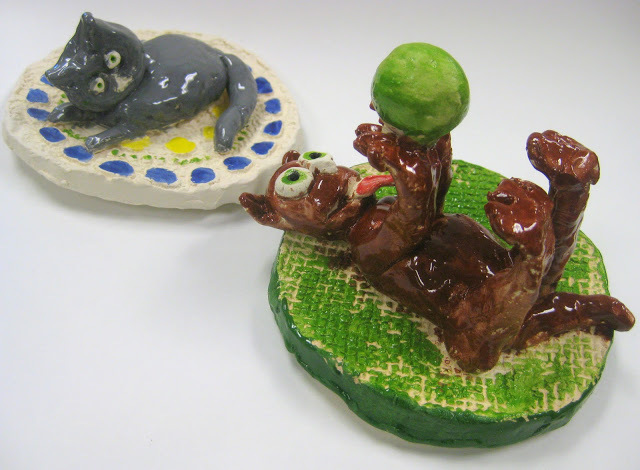 That year, my second graders created this version of pinch pot pets: two pinch pots put together to create the body of their animal. 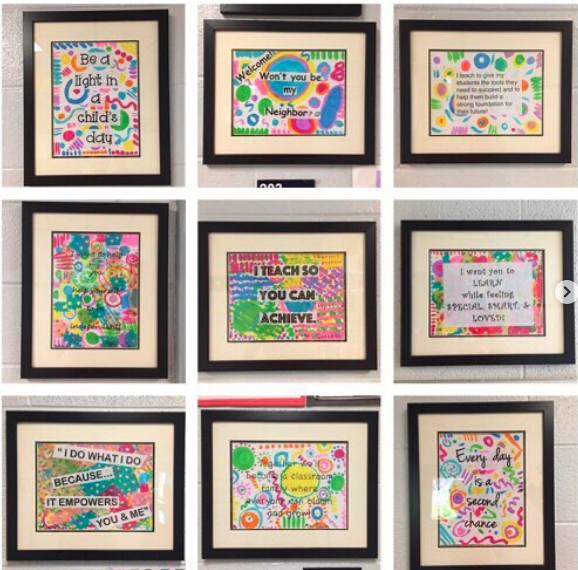 And my fourth graders created these! Definitely a favorite by both me and the kiddos. Yet another spin on pinch pots and animals: using the pinch pot as a container. 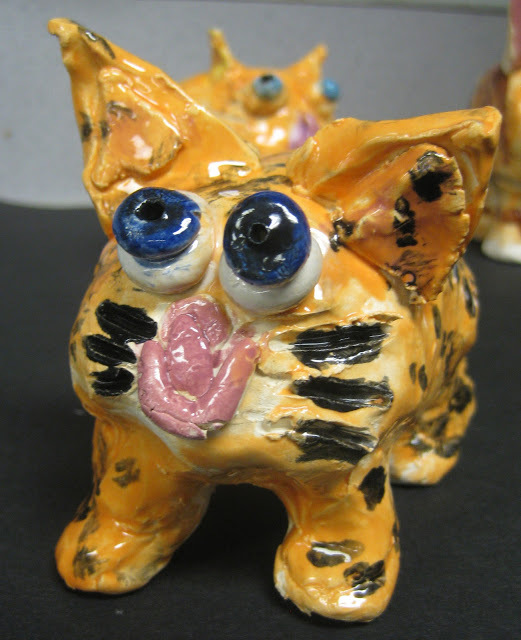 Our school mascot is the tiger and this particular year, second graders created tiger pinch pot containers. 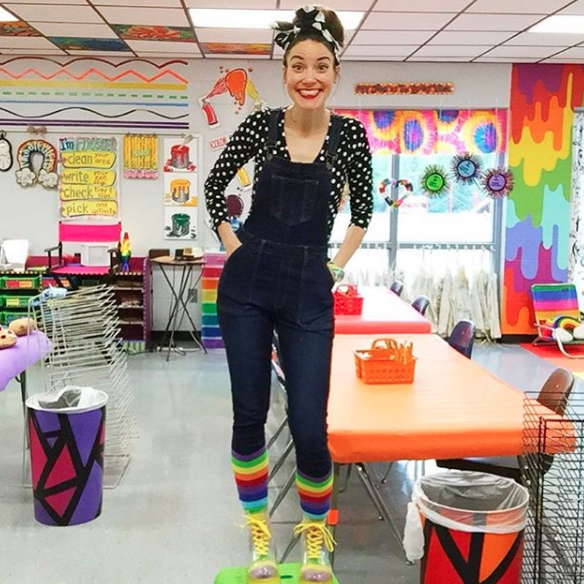 Now last year, I decided to go for a food theme and create the art room into a 1950's style diner. 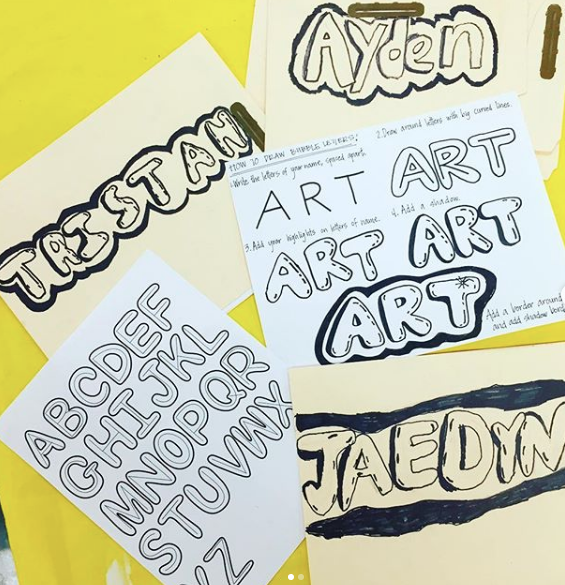 These projects were not shared in detail like my others because...I was in the middle of writing my clay book and these projects are all featured in that book! The book is written to be used with no kiln fire clay...but, as you can see, you can use kiln fire clay as well. You can scoop up your book here. My first graders served up these coffee and donut delights. 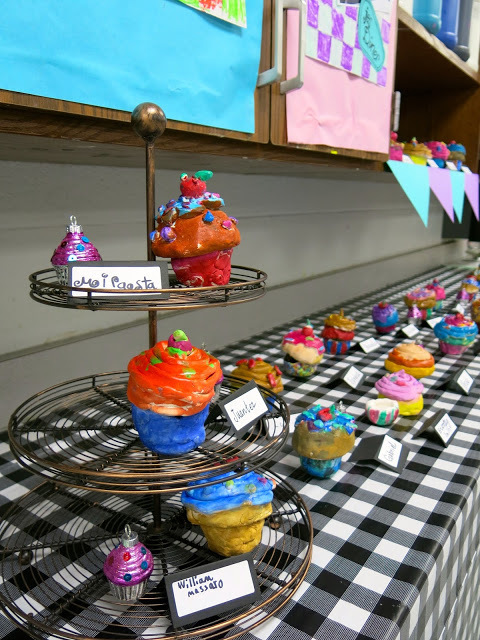 Second grade backed up cupcakes. Y'all better believe the retro lover in my totally enjoyed decorating for this art show! Third graders made hamburgers and fries...complete with all the fixin's. While others made pancake containers with hand painted paper plates. A kid and crowd favorite were the pie containers. The kids had so much fun googling pies and sculpting their favorite. While other classes did pizza containers. I reached out to a local pizza place for the boxes to display the pizza in. This year, we are back at it with an animal theme! We are transforming the art room into a pet shop. Third grade is in charge of the reptiles. Fourth grade had a blast creating these bobble head pets! 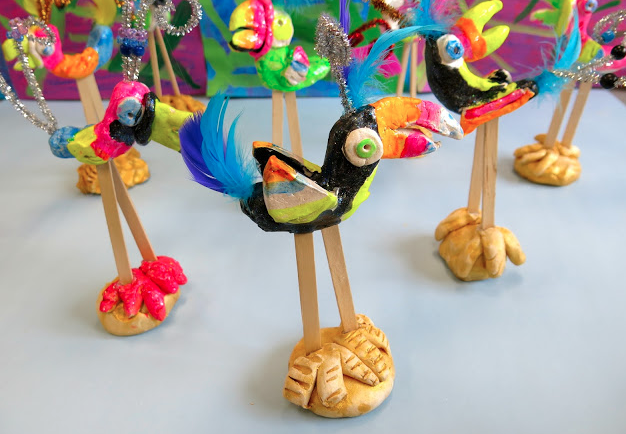 But a crowd favorite so far are these fun and funky birds by second grade. They crack me up! Many more clay projects are coming up so stay tuned. However, if you just can't wait, you can see a handful of clay projects that have not been shared here but are on my YouTube channel. I always upload there first...so if you'd like to stay up to date, you might consider hitting subscribe.